That’s a wildlife manager’s term for losses of livestock and pets, and you will recall that reducing those losses has been a significant rationale for the sport trapping and hunting seasons inaugurated in the fall of 2012. But are the seasons working? In a solid three hours of testimony, I didn’t hear a single indication that the killing of 562 wolves by sportsmen, and another 430 by government agents and landowners, and who knows how many by poachers, is having an effect at all. Or ever will. Whether Tuesday’s testimony before the House Committee on Environment and Natural Resources will have any effect on state policy is equally dubious; it was an “informational hearing” only, and no legislation to change course is under consideration. An effort last year to suspend the hunt for rethinking went nowhere. One explanation could be that we had an extended winter last year. There is some correlation between winter severity and depredation conflicts, so when we have a severe winter, typically the following summer we see fewer conflicts; when we have a mild winter, we typically see higher depredation conflicts. In 2012, which marked not only the beginning of the hunt but also the transfer of intensive government trapping for depredation control from federal authority to the DNR,122 complaints of wolves killing livestock or pets were verified and 295 wolves werekilled in response. Of these, 262 were trapped by the DNR; 17 were trapped, and 16 shot, by landowners empowered to kill wolves on the basis of losses within the past five years. 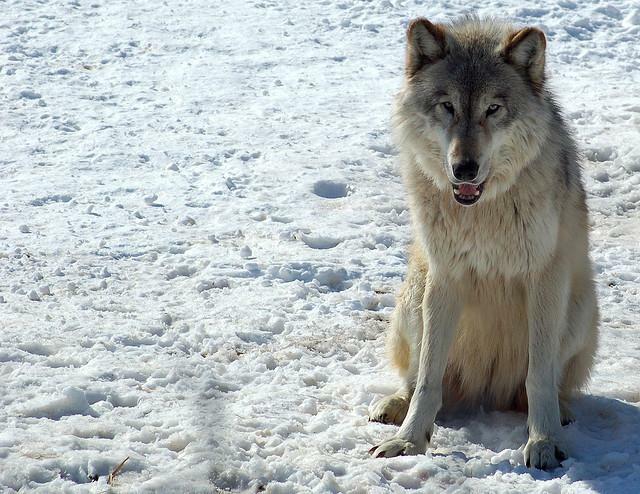 In 2013, only 70 complaints were verified and 135 wolves killed. Of these, 110 were trapped by the DNR; 4 more were trapped and 8 shot by landowners under the five-year rule; another 130 were killed by state-employed trappers in a new program begun last year. For comparison purposes, sport trappers and hunters reported taking 413 wolves in 2012 and 149 in 2013, somewhat more than the DNR’s targets of 400 and 132. Those characterizations drew a pointed rebuttal, after the hearing, from Maureen Hackett, founder of Howling for Wolves. She provided me with U.S. Department of Agriculture data from the period 1996 through 2011, when the feds were in charge, and the data do show that in six of those 16 years, the numbers of wolves killed for depredation control were smaller than the 135 Stark had cited as a low-water mark in 2013. All six were in the current millennium. However, the figure of 70 verified depredation complaints for 2013 —65 livestock, mostly calves, and 5 pets —does seem to represent at least a near-record low. Only once from 1996 through 2011 did USDA record a lower total; and the annual average in this period was about 50 percent higher, by my calculation, at 107. At this point you may be thinking: Huh—70 animals lost in a year (or 107, take your pick), and this is a big honking problem? Precisely that point was highlighted by Howard Goldman, senior state director in Minnesota for the Animal Humane Society of the U.S. He pointed out that there are 165,000 calves in Minnesota’s wolf range, which maybe kinda dwarfs a loss of 65 to depredation. Turning again to my trusty calculator, I find that if Goldman’s calf count is correct, the casualties reported by Stark represent a loss rate of .00039 percent. Goldman’s testimony prompted a sharp rejoinder from Rep. Tony Cornish, R-Vernon Center, who used to be a DNR conservation officer and investigated complaints about depredating wolves. He said it was “bogus” to rely on the figure of 65 livestock kills because the real losses could be three or four times higher than what investigators can verify. Which, if true, could mean a loss rate as high as .00157 percent. The USDA figures supplied by Hackett show that, typically, half to two-thirds of reported depredation kills are verified. Responding to friendly questions from Rep. Tom Hackbarth, R-Cedar, Stark said that the DNR spent $250,000 on depredation control in 2012, nearly all of it for the trapping. He also noted that this amount doesn’t include compensation payments for confirmed livestock losses. That’s a program in the state Agriculture Department, and in 2012 it paid out $119,659 on 81 complaints. In fiscal year 2013, the payout was $113,714 on 94 complaints. Asked by Rep. Jason Isaacson, DFL-Shoreview, if the department was putting any effort into “nonlethal control” — better livestock protections and wolf-deterrent methods that have been shown to work in some situations — Stark said the department is working on a brochure. His question brought the DNR’s enforcement chief, Maj. Phil Meier, to the microphone, who said there were six cases in 2012, zero in 2013. Titters from the audience ensued. Meier was unable to say how the cases were prosecuted or what the penalties were. Hansen observed that with the beginning of sport seasons, the Legislature had lowered the restitution value of poached wolves from $2,000 to $500. Because non-DNR speakers were held (rigorously) to three-minute time limits on their remarks — just what you want in an informational session — some of the most interesting testimony was cut off just as it was getting started. For example, there was Adrian Treves of the University of Wisconsin at Madison, a Ph.D. ecologist whose focus is on predator-prey ecology and wolves in particular, and who has been watching closely the resumption of sport trapping and hunting in Minnesota, Wisconsin and Michigan. It’s not even clear, he said, that “lethal control” programs of intensive trapping in areas of high livestock losses, of the type federal agencies and now the DNR have relied upon in Minnesota, are very effective in reducing depredation. This is perhaps the point that matters most to Hackett and others who are urging the DNR to consider undertaking efforts to promote nonlethal controls.